20160311 - Up in the am and in to work. Found out that Dave from work is trying to sell a car from a coworker. I know that Dave takes great care of his vehicles and walked into his office and bought the car. Home and we all took G to his pinewood trials and then went out to dinner with the Mallonns. 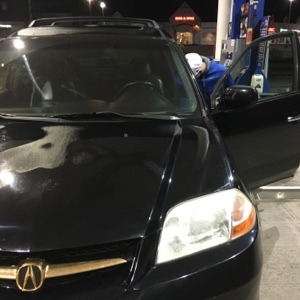 After dinner D&I drove to Powell, stopped at a Starbucks and then to Dave's to pick up the 2001 Acura MDX.